Sol House has quickly established itself as a top hotel for young clubbers who want sophistication. 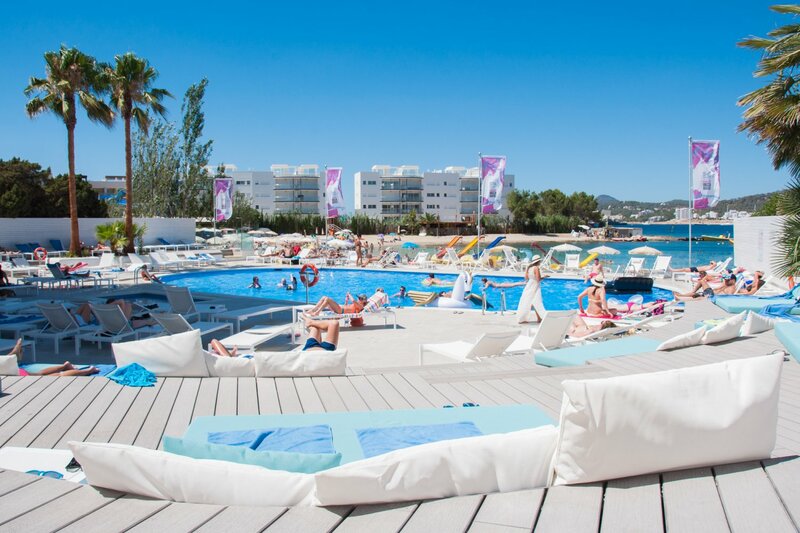 The four-star hotel Sol House Ibiza in San Antonio Bay, now entering its third year, has quickly established itself as the hotel for discerning clubbers. An energetic and stylish place with guests to match. One of the immediately prominent features is its beachside location. Perched next to Playa Pinet, this stretch of sand feels like the gateway to the entire island: to the south there's a wealth of coastline waiting to be explored; to the north, a variety of indulgent pastimes. You can unwind on Playa Pinet after a busy day of activities: arguably, the best thing about this beach is that it backs onto Sol House. It is only a short stroll back to the hotel if you want to escape the midday heat - or you could stay and channel your inner Bob Marley at the Reggae Reggae Beach shack. In fact, numerous beaches and sheltered coves are dotted along the western coast. The bus and water ferry services make exploring this part of the island very accessible. Cala Conta and Cala Salada are close by and blessed with soft golden sands and turquoise waters. If you prefer your beaches livelier, then Cala Bassa with its famed Cala Bassa Beach Club should be high on your agenda. Back inside Sol House Ibiza, the rooms have a sleek, contemporary design. Provocative artwork and chic decor add to the allure and the hotel excels in maintaining a vibrant atmosphere. There is a big commitment to music fans. This is a hotel with electronic music in its heartbeat. Notable island faces such as Jose Padilla and Paco Fernandez have appeared at the hotel's Sol Sets series in the past. There are daily poolside sessions providing a mixture of chilled and groove-laden beats. As the afternoon carries on into evening, it's time to take a trip to the top floor: There you will find rooftop terrace, the Rooftop Nine bar, which is slick, and offers some impressive panoramic views. Sol House Ibiza has already solidified its status as one of the key spots to watch the sun dip into the Med. Hosting a series of live DJ streams from some of the island's biggest promoters no doubt accelerated this reputation. Of course, even the most ardent house music fan can need a break from the 4/4 beats found everywhere. Fortunately, Imagine is only a stone's throw away back on Playa Pinet beach. Not only does it offer an alternative music policy, but the local food is as good as the cocktails are strong. Staying at Sol House Ibiza makes you ideally placed to sample the island's gastronomy too. It boasts three on-site restaurants. The Tex-Mex-inspired Canalla, self-serve buffet Food Factory and Play Bar all offer something different. We also recommend checking-out the food at Hostal La Torre in Cap Negret and Rio Ibiza on the promenade. Sol House is geared towards those who prefer life in the fast lane. With every minute of a vacation being precious, the onus is to squeeze-in as much activity as possible. Conveniently, amenities found both on the doorstep and a little further afield cater to that mindset. If you identify as an adrenaline-junkie, then there's no better place to stay as nearby you can zip along on a guided jet-ski tour or try out the futuristic flyboard. Old favourites like the banana boat and speedboat are still as exhilarating as ever. If you want to do more than one activity, you can save money on a great value watersports' pack. Alternatively, spend your evening chilling on the Oceanbeat Catamaran as the sun sets behind mystical Es Vedra. If the day presents thrill-seeking pursuits, then the night is certifiably white-knuckle. This is why Ibiza is famous the world over. A short stretch around the bay is Ocean Beach Club. Specialising in bottle service and regular champagne showers, the beach club hosts decadent pool parties seven days a week. If you head further along San Antonio Bay, you will find sunset bar Kumharas and a cool, cosmopolitan clientele. An idyllic setting to watch sunset. Of course, no trip to San Antonio is complete without a stroll along the Sunset Strip. Visiting the world-famous Café del Mar and Café Mambo is a rite of passage. San Antonio Bay is close enough to the nightlife, without it taking over, so you can have party and peace side by side. Sol House's ace is to be a fun social hub and one which has made a lasting impression on a new generation of island visitors – time to see for yourself.